Իզաբելլան կարճահասակ, բայց կայուն կազմվածքով, բաց մաշկով անձնավորություն էր, ում մազերի գույնը տատանվում էր ելակագույն շիկահերից մուգ թխահերի սահմաններում: Նրա դուստրերը` Ժուաննան և Կատերինը, ավելի շատ էին նման իրեն: Իզաբելլան պահպանում էր խիստ ժուժկալ ապրելակերպ, իսկ կրոնական հոգին նրա վրա ազդել է կյանքի մեծ մասում: Չնայած նրա թշնամական տրամադրվածությանը մուսուլմանների հանդեպ՝ նա գնահատում էր մուսուլմանական ոճը և մշակույթը: Նրա մասին հնչել են հետևյալ կարծիքները. ↑ 3,0 3,1 3,2 German National Library, Berlin State Library, Bavarian State Library et al. Record #11863982X // Gemeinsame Normdatei — 2012—2016. ↑ 29,0 29,1 ↓ Spanish historian Cesáreo Fernández Duro: "...For those who ignore the background of these circumstances it will certainly seem strange that while the Catholic Monarchs raised a temple in Toledo in honour of the victory that God granted them on that occasion, the same fact [the Battle of Toro] was festively celebrated with solemn processions on its anniversary in Portugal" in La batalla de Toro (1476). Datos y documentos para su monografía histórica, in Boletín de la Real Academia de la Historia, tome 38, Madrid, 1901,p. 250. ↑ 46,0 46,1 Battle of Guinea: ↓ Alonso de Palencia, Década IV, Book XXXIII, Chapter V ( "Disaster among those sent to the mines of gold [Guinea]. Charges against the King..."), pp. 91–94. This was a decisive battle because after it, in spite of the Catholic Monarchs' attempts, they were unable to send new fleets to Guinea, Canary or to any part of the Portuguese empire until the end of the war. The Perfect Prince sent an order to drown any Castilian crew captured in Guinea waters. 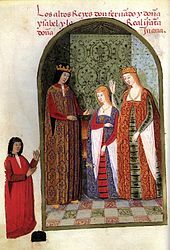 Even the Castilian navies which left Guinea before the signature of the peace treaty had to pay the tax ("quinto") to the Portuguese crown when they returned to Castile after the peace treaty. 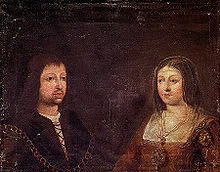 Isabella had to ask permission of Afonso V so that this tax could be paid in Castilian harbours. Naturally all this caused a grudge against the Catholic Monarchs in Andalusia. ↑ 49,0 49,1 ↓ Bailey W. Diffie and George D. Winius "In a war in which the Castilians were victorious on land and the Portuguese at sea, ..." in Foundations of the Portuguese empire 1415–1580, volume I, University of Minnesota Press, 1985, p. 152. ↑ : ↓ Alonso de Palencia, Decada IV, Book XXXI, Chapters VIII and IX ("preparation of 2 fleets [to Guinea and to Canary, respectively] so that with them King Ferdinand crush its enemies [the Portuguese]..."). ↑ 54,0 54,1 ↓ Mendonça, 2007, p. 101–103.